Combined with 100% natural ingredients, this intensive moisturizing body lotion contains 10% of manuka honey IAA10+, carefully selected for its unique activity. 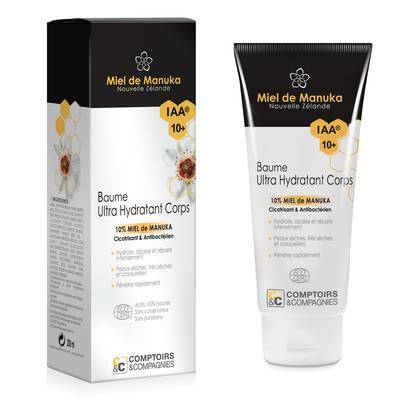 Preservative-free, paraben-free, this intensive moisturizing body lotion 10% manuka honey is organic certified by Ecocert. Thanks to its rich texture that gets absorbed rapidly, this is the ideal daily lotion to intensely hydrate and repair very dry and damaged skin. AQUA ( WATER), BUTYROSPERMUM PARKII (SHEA) BUTTER*, MEL (HONEY), COCO CAPRYLATE/CAPRATE, HELICHRYSUM ITALICUM FLOWER WATER*, ALCOHOL**, CETEARYL ALCOHOL, COCO-CAPRYLATE, SORBITAN STEARATE, HELIANTHUS ANNUUS (SUNFLOWER) SEED OIL*, MACADAMIA TERNIFOLIA SEED OIL*, CETEARYL GLUCOSIDE, PARFUM (FRAGRANCE), LEUCONOSTOC/RADISH ROOT FERMENT FILTRATE, GLYCERYL UNDECYLENATE, CERA ALBA (BEESWAX)*, TOCOPHEROL, XANTHAN GUM, BISABOLOL, LEVULINIC ACID, GLYCERIN, SODIUM LEVULINATE, LINALOOL, LIMONENE, GERANIOL. 100% du total des ingrédients sont d’origine naturelle. 22,30% du total des ingrédients sont issus de l’agriculture biologique.